As M and I have gotten more and more into this Crossfit thing, we’ve tried to find ways that we can contribute to our friends’ slash trainers’ business endeavor. Partially because we can workout with them for free right now (other Crossfit gyms in the area charge as much as $350.00 a month for membership), but mostly because we want to see their gym-owning dreams become reality. A Big Effing Tire. Of course, this picture doesn’t do it justice. The tire is about 5 feet tall and it weighs about 150lbs, which is much lighter than we thought. (Basically that means we’re technically still on the prowl for an even heavier tire.) I’m not sure what kind of vehicle this tire came from, but I know that a grown man could fit inside it and roll down a hill Natty Gann style. 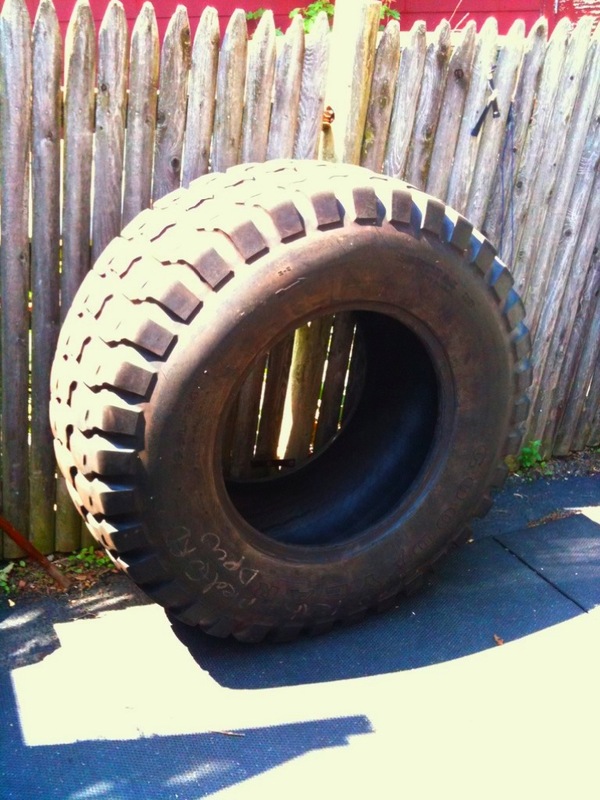 This tire is great for flipping and sledgehammering. The day we got it, we rolled it over to the gym, conveniently located in our friend’s driveway two blocks away, and went to town. 20 Tire Sledgehammer Strikes (for lack of a better term) 10 on each side. I think I like AMRAP workouts because they force me to get competitive with myself and work as hard as I can for as long as I can. Luckily, I was able to do all of these exercises as prescribed, so I really felt like I was working as hard as possible. It took a little while to get the hang of the sledgehammering: swinging a 10lb hammer over my head was not a motion I was used to, but I got into a rhythm after a while. I heart the Big Tire! Using things like Big Tires and sledgehammers really keeps our workouts interesting…I’d much rather flip a tire out in the sun than do a million reps on the smith machine at the gym. M and I are looking for other interesting pieces to add to the collection. Methinks M has his eye on some Undulation Ropes…I’ll let you know how that goes. Have you ever worked out with unconventional equipment before?